Even though fires in turbine enclosures do not occur very frequently, they are a costly, dangerous, and looming threat if your facility does not have adequate protection. Turbine generators, used as an energy source in many plants and facilities, are powerful yet vulnerable machines. Facility managers have long toiled over deciding on the safest and most effective way to protect these vital systems. Low-pressure and high-pressure carbon dioxide (CO2) systems are currently the most common systems used, but the industry is now leaning towards a safer solution; water mist suppression. Carbon dioxide has many positive attributes as a fire suppressant. Often known as the "original" clean agent, it does not leave behind residue that damages equipment, it is plentiful and non-corrosive, and is highly effective. CO2 suppresses fires through oxygen dilution, unlike other clean agents (ex: halon). According to a study presented at the Fire Suppression and Detection Research and Applications Conference (formerly HOTWC), the concentration range of CO2 needed to suppress most fuel fires ranges between 34% and 72% volume/volume percent (v/v). CO2 levels above 7.5% v/v are extremely dangerous to humans. Fainting, convulsion, or death can occur within seconds of exposure (Skaggs 1998). An EPA study investigated the different CO2 fire suppression incidents that resulted in injury or death. From 1975 to 2000, 51 such incidents were found. Out of these incidents, there were 72 deaths and 145 injuries (EPA 2000). All of the deaths due to CO2 occurred from asphyxiation. Incidents were a result of lack of safety procedures, failure to follow the procedures, and lack of technical ability. The knowledge of the hazards related to CO2 systems has been a main factor in the push for more safety guidance and regulation with the systems. NFPA 12 Section 4.3 now requires all CO2 Systems to have proper safety procedures and life safety equipment in place. You can download NFPA 12 and access section 3.4 for free on the NFPA website. Although CO2 has many great firefighting attributes, its inherent danger to worker safety has many looking to alternative methods that offer equal suppression and minimal life safety threats. Contrary to carbon dioxide, high-pressure water mist systems are non-hazardous to personnel. 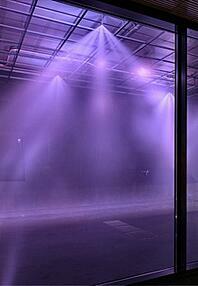 Water mist has many benefits that gaseous agents do not have. These include no toxicity issues, minimal damage and reset times, and no requirement for an "air tight" enclosure (Marioff). The most common manufacturers of these systems are Marioff, Fike DuraQuench, and Securiplex. Each manufacturer is aware of which system is best suited for each application. Although water mist is not the most frequently installed fire suppression system for steam turbines, it is becoming an increasingly attractive option within the industry. Beyond CO2 and water mist suppression systems, we have seen other clean agent or aerosol suppression systems used in turbine enclosures. FM-200TM is a fast acting clean agent that extinguishes in 10 seconds or less. Similar to water mist, its total flooding system is an environmentally responsible clean agent choice. FM-200TM is expensive to refill but offers lower ongoing maintenance costs. It has gone through exhaustive safety testing and has been determined to be safe for humans (Chemours). Halon, a clean agent, is found around the turbine package is some plants. Halon breaks down the chain of reaction between oxygen, fuel, and ignition in a fire to stop it in its tracks. It is not harmful when safe exposure limits are observed. Halon is no longer available for sale in the U.S. and hard to find parts for. There currently is no U.S. requirement to remove this system from operation. Due to the difficulty of servicing and obsolete valves, it is recommended to upgrade to a more modern suppression system. Aerosol suppression systems have the advantage of being easy to maintain, but can be expensive to clean up after discharge. The NFPA defines aerosols as a finely-divided solid, and they remain in the air for a long time and are total flooding agents. Stat-X Aerosol is currently used for small packaged generator enclosures. The possibility of fires in turbine enclosures is an intrinsic threat. We have seen a variety of different fire suppression systems used to protect these enclosures, but there is a need to update existing systems with the most advanced and safest technology. Water-based protection is a viable solution to the life safety and suppression problems that currently exist. If you have any further questions on fire suppression in turbine enclosures, please do not hesitate to contact us and speak with an expert.